This was a tough one from Cumbria. 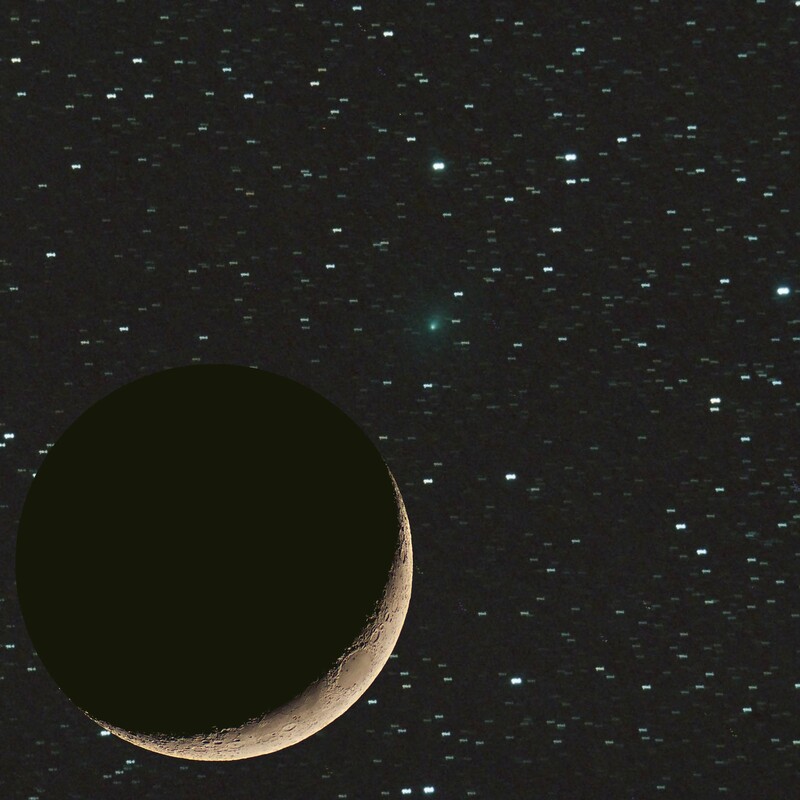 My interest in astrophotography embraces several categories of night sky objects, but perhaps none more so than comets. Having met some of the Rosetta Team at the EPSC last year, I have felt a real affinity with this mission and had determined to capture comet 67P/Churyumov-Gerasimenko when visible from the UK. Opportunities have been very few, but one came along on the night of 10 September / morning of 11 September 2015. The comet would be visible low in the very early morning sky, so I needed a clear view to the north east. The obvious choice would be a dark location to the east of Kendal, looking across the Yorkshire Dales, but as there was some chance of cloud in the forecasts, I opted for my tried and tested lay-by on the A591 between Kendal and Windermere. A little light pollution could be more easily eliminated than cloud cover. 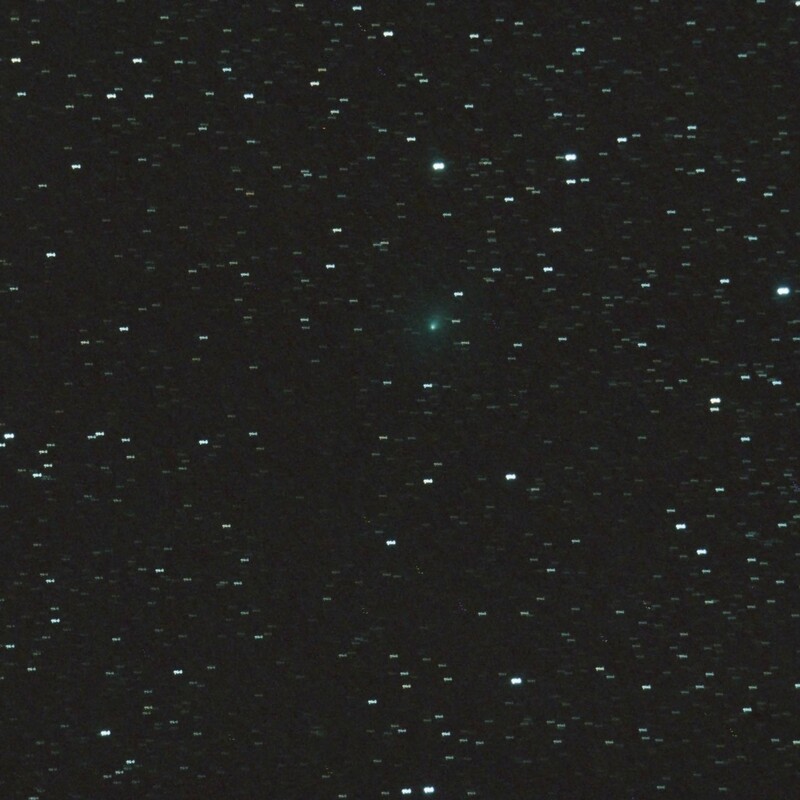 I headed out about midnight, with another comet in my sights as a practice target – it’s been a while since I did this! The mount setup went as smoothly as could be expected, and I achieved polar alignment accurate to less than one arc minute. That means the axis of the rotating mount was less than one sixtieth of a degree out of alignment with the rotation of the Earth. Good enough for 5-minute exposures, and to be on the safe side I kept it down to 3-minute exposures. 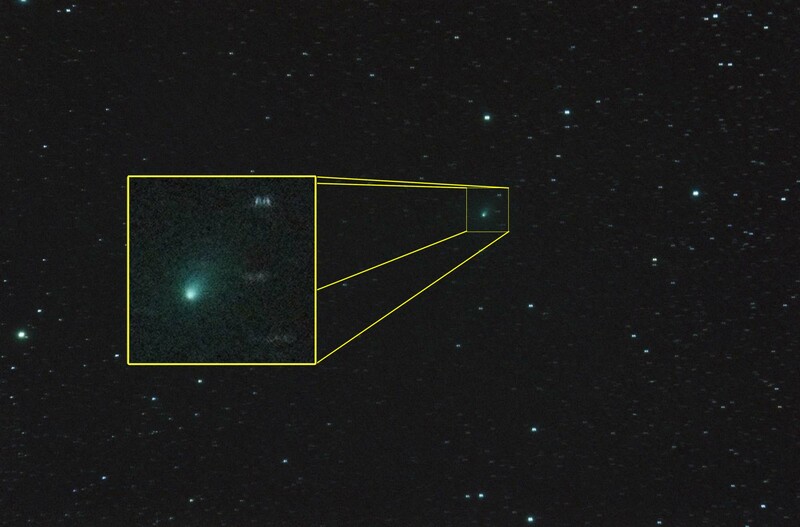 First up, a stack of six frames of comet C/2014 S2 (PANSTARRS), almost overhead. This comet had apparently been in outburst – i.e. 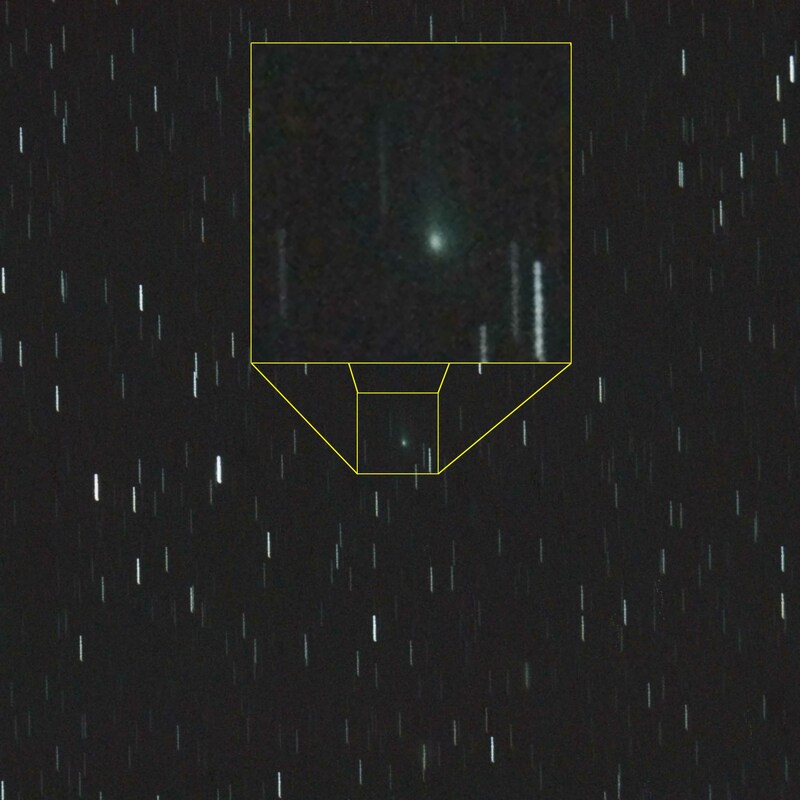 brightening unexpectedly – but brightening from Magnitude 15 is still pretty dim. ISO 1600, 6 x 180 sec. You can see the tremendous amount of noise in the background, much of it from the humidity in the Cumbrian air catching and scattering stray light from nearby – even though I am using a light pollution filter between the telescope and the camera. As night turned to morning, so arrived the time I had been waiting for: 67P/Churyumov-Gerasimenko came up over the horizon only 45° ahead of the Sun and 23° ahead of the crescent Moon. At 4:13am, when I started shooting the first frame, the comet was only 18° above the horizon. Not the best conditions for a true once-in-a-lifetime opportunity to photograph a comet that has the ESA Rosetta probe orbiting round it, and its lander, Philae, on the surface. By the final frame at 5:02am, the sky had become noticeably lighter as we were well into nautical twilight. ISO 1600, 15 x 3min. The magnification panel shows a square that is only 5.8 arc minutes on each side. Yes, it’s just a smudge on a dark photo covered in short lines, but that smudge is 266 million kilometres away and completely invisible to the naked eye (it’s about one sixth of one percent of the faintest star visible unaided). Inside that smudge is the nucleus of the comet where the ESA landed a probe after ten years flying through space. The light photons took nearly 15 minutes to reach my camera, and I left the shutter open for 3 minutes at a time. I sat in a picnic chair in a lay-by five minutes’ drive from home, and photographed it with a camera that is normally used for holiday snaps. Happy times!